I posted the Northampton Marshalls to the ghotes web site several years ago. I wanted to share it and if there was any other Marshall descendant out there, maybe they wouldn�t have to go through quite so many hoops to find their roots. Occasionally I heard from folks who had discovered the site but their interest was, for the most part, female lines or seeking information on one of the other Marshall families in the area. Then I heard from Frank Courtney. Frank had a box of pictures marked �family� from his mother�s attic; and combined with notes made in his baby book, he was attempting to discover his heritage. One of his photos was marked �Robert Henry and Elizabeth Marshall.� My gut joined my heart and I wanted in on the chase. Well, there was a pretty big problem. 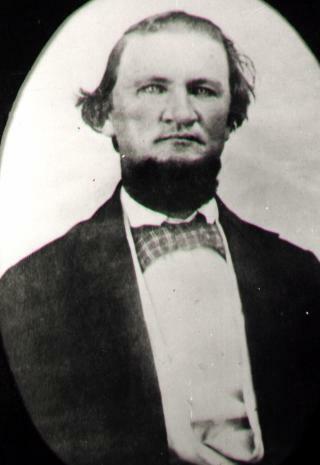 Robert Henry Marshall, brother of Charles, only had three children: Alice, Alexine and Charles. Frank was looking for someone (probably a Marshall) who married a Sturgis � nope! The problems were compounded as Frank�s mother had mixed up some names when she tried to leave them for Frank before her death. Further digging followed and Frank came up with a death card for L. H. Sturgis and a letter signed by �Mama Ella.� Then another Sturgis researcher joined the hunt - enter Linda Harrison. Linda found information that there was a widow, Ella Marshall Foster, who had married a Littleton Sturgis. More research and the information began closing in. Ella and Littleton eventually proved as Frank�s line when he got his hands on a death certificate. But there�s not a single Ella Marshall in the Northampton clan. Into MK & Barry�s �Miles Files� I went (for the umpteenth time) in the hope that Ella might be connected to the Seaside family � nope! Uh oh, had to start through the storage boxes to find notes on the Accomack Marshalls from Jim Marshall � nope! As Frank�s Sturgis line began to fall into place, Ella was a dead end. Vern Skinner kept his eyes open for me and found some estate information on Robert Henry Marshall in Somerset County, but no will or distribution. Matt Wise took another look at some of his information, and I got my hands on some family documents; Robert Henry only had those three children. Ella must�ve fallen from the sky! Then before Christmas 1999, pushing four years into the mystery of the old picture in a box marked �family,� I got an e-mail. Marianne MacMaster had been busy at work surfing the web and found the ghote site and the Marshall journal. She wrote that she had a family Bible that went back to a Robert Henry Marshall and was this the same family? Certainly, everyone who has worked on their family history has had at least one special genealogy moment. I have now been blessed with three great ones. You know, when you�re drifting off to sleep and something clicks or you read a name that jolts the wheels to turning? I was back on line in seconds and my answer came when my phone rang. I had a sure hit, Marianne�s Robert Henry Marshall was definitely the brother of my Charles and a copy of Robert�s Bible was on its way��.along with the notation in the Bible that Alexine Marshall was Mrs. Littleton Sturgis. Mysteries solved. Alexine evidently didn�t like the name used in the census or in her aunt�s diary and even opted to use �Ella� for her marriage licenses; but the Bible record clinched it. Well, Frank�s still trying to iron out some collateral lines and match up some of his other photos. Linda eventually got both of her Sturgis branches but she, too, has a Foster who�s probably kin to dear Ella�s first husband! Marianne got her Marshall line back to the 1600�s with the click of the �send� button and an added bonus. Seems her Marshall married a Purnell and, bingo- her whole genealogy on a silver platter. Me, I�ve added a whole new limb to the Northampton Marshalls (to that Robert Henry I thought I had to begin with); but, more importantly, I had a great time! Take a look and see if Charles and Robert Henry look like brothers to you. Their pictures are linked to this document. And what just arrive in my mail? An old photo album from a distant cousin, packed full of pictures of ladies in the craziest hats you�ve ever seen. Pictures taken in Princess Anne, Crisfield, Charlottesville and Los Angeles between 1804 and 1810. A kind soul wrote the dates and places in the album but not the names. Me thinks my next two projects are waiting: write names in my own photo albums and then try to tackle the identification of a bunch of Marshalls, Scotts, Whittingtons & Lankfords in this old album! Lessons learned: Patience, Sharing the search with others, GHOTES, and just enjoy the search! 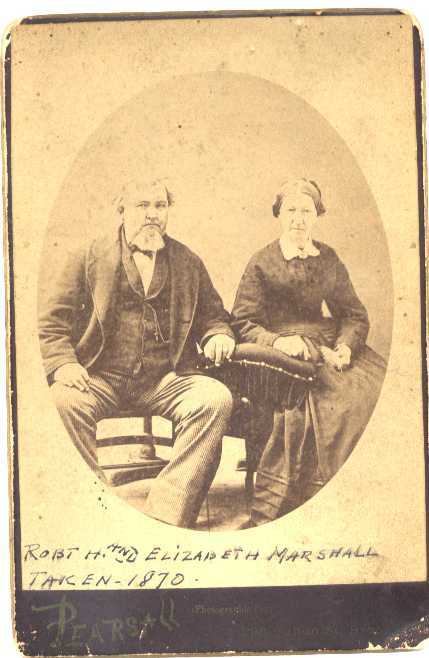 Robert Henry and Elizabeth Marshall's daughter Alexine, also known as Ella, and who first married a Foster, married Littleton Sturgis. Discovering that Alexine Marshall Foster and Mama Ella Sturgis were one and the same opened up new worlds of connections for many happy people.